In 2013, Pope Francis publicly stated he’d get to the bottom of several scandals plaguing the Catholic Church. Despite the pontiff’s investigation, one scandal remains shrouded in mystery: that of the Vatican Bank and Nazi gold. You see, some bits of evidence suggest the Vatican collaborated with Nazi party members responsible for plundering Jewish citizens’ gold during World War II. But other evidence casts doubt on the extent of the Catholic Church’s direct participation in Nazi activities. The Holy See has long denied any sort of affiliation between the Church and the Third Reich ever existed. Still, limited independent research into a possible connection has been conducted by several agencies, including the U.S. Treasury. The Ustasha, an organization also known as the “Nazi Puppet Regime,” operated in Yugoslavia from 1929-1945. It functioned as a fascist terrorist movement that supported Nazi and Italian forces. During World War II, Ustashi military members gathered an estimated 500,000 Serbs, Jews, and Gypsies and demanded 1,000 kilograms of gold from each, wrote ABC News on Feb. 15, 2013. They were told the money would prevent their murders. But once the funds were handed over, the groups were sent to concentration camps anyway, where most of them died. The clergy’s involvement was eventually exposed. A trial in 1946 resulted in the conviction of six Ustasha priests total, including former Franciscan Miroslav Filipovic-Majstorovic – the overseer of a concentration camp where the Ustashas killed hundreds of thousands of Jewish Serbs. Though Fr. 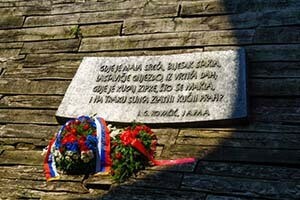 Filipovic-Majstorovic oversaw one of the death camps, it was Fr. Krunoslav Draganovic who had directed the entire murderous priesthood. The Franciscan was also a senior official of the Ustasha committee. Foreseeing defeat near the end of the war, in 1943, the Ustasha made arrangements with the Vatican for Draganovic to be sent to Rome. There he served at a clandestine Ustasha hub disguised as a seminary. Draganovic and other collaborators helped procure the means and support for a number of fellow Ustasha war criminals attempting to escape persecution. They even managed to forge Red Cross passports. Eventually, through an underground railroad of sympathetic priests known as “the Ratline,” several members of the Ustasha escaped to neutral countries (primarily Spain and Argentina). Virtually the entire “puppet regime’s” leadership went free – largely due to help from the Vatican. When Germany surrendered on May 7, 1945, 288 kilograms of gold were removed from the Croatian National Bank and state treasuries. Some of that landed in Draganovic’s hands. Called the “Golden Priest,” he continued to dole out funds to Croatian refugees from his new home in Rome. He was never officially charged for war crimes and returned to Yugoslavia after the war. He died in 1983 in Sarajevo. On July 23, 1997, The L.A. Times revealed that documentarians from the television networkA&E had discovered proof in the Vatican Bank’s archives of a Nazi gold scandal. Specifically, they uncovered a memo amid a trove of already declassified material that totaled over a million pages. The documentarians were the first to thoroughly sift through the humongous cache of information. The memo had been composed by former U.S. Treasury Department field investigator Emerson Bigelow. After the Second World War, Bigelow conducted several investigations throughout Europe. This is when he purportedly connected with a viable source that could link the Vatican Bank directly to Nazi gold. Bigelow outlined all of this information in his memo that, for an unknown reason, was never received. When survivors of the Ustasha regime learned of the documentarians’ investigation, they formally requested Bigelow’s report be released under the Freedom of Information Act in 1997. The survivors filed a lawsuit against the Vatican Bank based on Bigelow’s memo in 1999. According to Concordatwatch.com, the case was originally brought before a California court in November 1999. Four years later, Vatican lawyers successfully argued the case was outside the jurisdiction of U.S. courts. The previous ruling was overturned. Then in 2005, an appeals court overturned that judgement and allowed some of the claims – primarily those for restitution – to proceed. However, on Dec. 30, 2009, the Ninth Circuit Court of Appeals in San Francisco re-upheld the original lower court ruling. The decision stated the Vatican Bank was immune from the lawsuit and further prosecution under the 1976 Foreign Sovereign Immunities Act. To this day, the Vatican’s archives – likely the only source that could directly tie the Vatican Bank with Nazi gold – have remained sealed.